Q1: How did your background in signal processing and machine learning lead you to work in cancer genome analysis at the Institute for Systems Biology in Seattle, Washington? After working in industry for 15 years (spanning sonar signal processing and cellular telecommunications), I decided to go back to school to earn a Ph.D. While doing research in natural language processing in the Electrical Engineering department at the University of Washington, I became interested in the field of computational biology where many of the same methods were being applied to understand and “parse” DNA and protein sequences. When I completed my Ph.D., I was offered the opportunity to come to ISB and be a part of the TCGA GDAC. 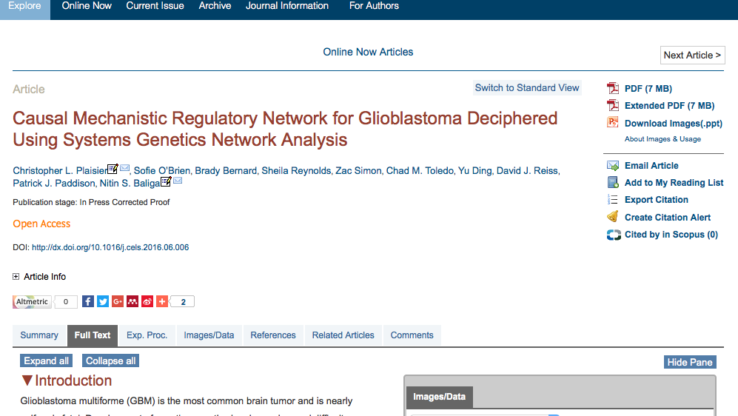 Q2: The ISB is one of The Cancer Genome Atlas (TCGA) network’s Genome Data Analysis Centers. What kind of resources there support your work? I played an active role in our TCGA GDAC since its inception, and the deep familiarity that I (and others on the ISB-CGC team) gained through that work — both with the types of data being generated by the TCGA program and the types of analyses performed by each working group leading up to the publication of each of the tumor-specific “marker papers” — has really guided our efforts in building the ISB-CGC platform. Our goal with the ISB-CGC is to provide a cloud-based framework and to develop tools that will make these data and analyses more accessible to a wider range of researchers while continuously exploring how best to make use of the variety of technologies being deployed by Google on their Cloud Platform. Institute for Systems Biology, Google and CSRA have jointly created a cloud-based platform that allows researchers to quickly, reliably and securely access massive amounts of data in ways that, until now, haven’t been possible.